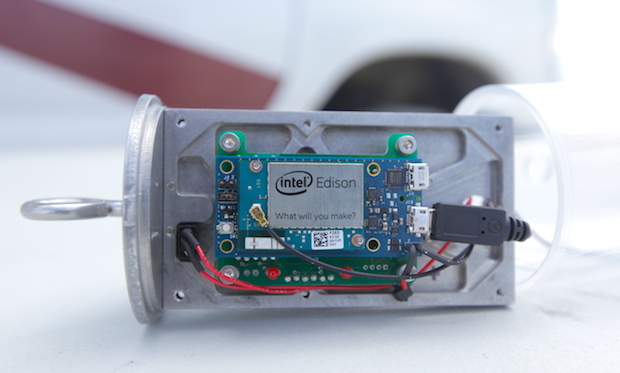 Intel's engineers have been working with students helping them adapt the tiny Intel Edison microcomputer to control satellites the size of a soda can. Above, a Can-Sat launch by Magnitude.io. Magnitude.io, a project-based education company in San Francisco, aims to boost interest in STEM subjects (maths, science, tech and engineering) with hackathon-style projects relating to the exciting world of rocket ships and aerospace. Students' imaginations are captured by the lure of rocketry and exploration and to attain the heights of outer space requires achieving new heights in core STEM subjects. On Sept. 8, 2014 Magnitude.io helped university students launch a rocket containing a CanSat, a miniaturized satellite that can fit inside a standard soda can, at Black Rock Desert in Nevada. At the heart of the CanSat is Intel Edison, a postage stamp-sized platform on a chip that contains dual-core Intel Atom and Quark processors, along with Wi-Fi and Bluetooth for wireless and cloud connectivity. Ted Tagami, CEO and co-founder of Magnitude.io, knew that he wanted Edison when an Intel employee in Japan pulled an alpha prototype out of his pocket. "I saw that, understood what it did, and said, 'We're putting that in space.'" "We knew Edison was perfect for aerospace because of its low mass and volume, with high-powered computing and low-power draw," Tagami said. "It also runs a Linux environment, and it can emulate Arduino, which is a great building block for students to get into things like sensors and motor controls." This isn't the first time that Edison has reached great heights; it was recently at altitudes of around 100,000 ft in near space as part of a weather balloon experiment. Magnitude.io didn't initially target only rocket science for its educational programs, but the area of focus made itself clear when the company found that teacher and students responded three times better to aerospace topics than any other. 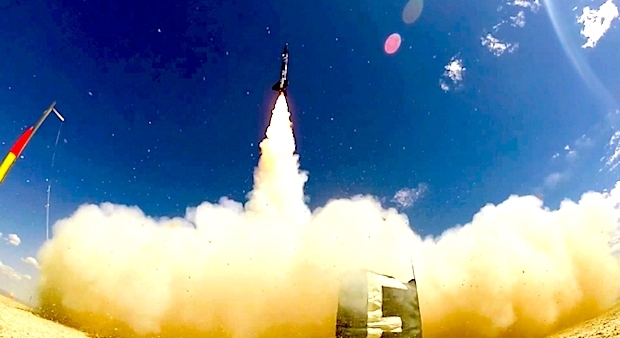 "We came across the rockets because we needed a great vehicle that could also teach basic principles of physics to students and the rocket was perfect for that," explained Tagami. "Everyone's imagination begins to get quite vivid when thinking about leaving earth." According to Tagami, these aerospace-related education programs at the high school level have students so engaged for hours that they often have to be offered only as after-school and extracurricular activities. The first Edison CanSat launch took place within days of the 15th anniversary of the first ARLISS (A Rocket Launch for International Student Satellites), which is a collaboration between Stanford University, other educational institutions and rocket enthusiasts to build, launch and recover prototype satellites. In another ARLISS connection, Magnitude.io has the expertise of Bob Twiggs on its advisory board. Twiggs proposed the university-based space program and later co-invented the larger form factor CubeSat, a one liter cubed-sized satellite. Magnitude.io and the UC Davis School of Education are now developing a curriculum mapped to Common Core and Next Generation Science Standards, where student teams go hands-on with a rocket to experience every step of a launch. "Students will gain hands-on laboratory experience in testing and analyzing data from a suite of sensors, including a magnetometer, barometric pressure sensor, humidity and temperature sensor, and an accelerometer," lists Magnitude.io's CanSat site. Tagami drew parallels between satellites quantifying the earth with IoT-connected sensors to how some people don wearable technology to track their health and daily activities. "The rockets are the first step in extending the Internet of Things to low earth orbit," said Tagami. The next Space Hackathon is November 7 to 9 at UC Berkeley.